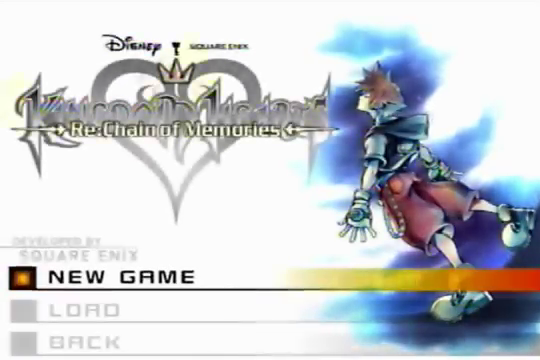 My look back at the Kingdom Hearts series continues with Chain of Memories, and an up-close look at both versions, new and old! The original Chain of Memories was my first Kingdom Hearts game, looking back I think it is probably the worst game to enter the series with: lots of story rehashes/simplifications for the Disney worlds, a continuation of a story you can only learn about from the journal and of course the difficult combat system. But still the game is dear to my heart and I'm probably one of the few people on the planet who finished Re:CoM about 8 times (in all different languages and releases) and liked it. It helps that CoM is an extremely straight forward game (if you don't want to reach the maximum level) though. I think the retrospective is off to a great start and covering both versions at the same time is a great idea. Let's see how spreading out the gameplay works, I agree that it's too much to write (and read) at a single time, all that helps fleshing out the Disney floors is a good idea since the real action of CoM happens before and after them. The gameplay is spread for quite a ways, but only time will tell how well it plays out! It's really strange though, considering the differences between [chi] and Unchained and how long these story updates take. This retrospective must be difficult. Between CoM, re:CoM, even 1.5 tacked on the trophies and added new treasure rooms to go along with KH2/Days, I think? Must be confusing to make sure to include all the little things and changes between them all, but it's fun to read. Tbh, I can't keep straight all the changes in the script outside some of Axel's dialogue. It's not quite "new treasure rooms" per se - the new chests are added to existing Rooms of Rewards. They were first included in the PS2 release and contained Keyblades from KH2. They were changed to Days Keyblades in 1.5. Some are mechanically identical but others aren't! I imagine they were torn about it, since they ended up running in opposite directions holding the same ball. If you've got Axel's changes in mind, that's going to hit most of the high notes. That and the Riku and Lexaeus thing. Was a big fan of the KH retrospective, and I think the CoM retrospective is looking good too! (1) Are you going to address the KHII connection? KHII established that everyone forgot Sora, because Namine made Sora forget them. Even Kairi forgot about Sora. To me, this implies that whenever Sora picked a world, like Traverse Town, the residents of that world forgot Sora. When Sora was traveling in the Traverse Town room, Leon's gang was slowly forgetting about Sora. (2) Is Replica Riku the only reason why Sora didn't forget about Riku? Take Kairi, for example. She pretty much loves Sora, but even she forgot about him. Riku remembers Sora in CoM, Days, and II. Is this because Sora fought with Replica Riku? Or is it because Sora's new memories entail hanging out with both Namine and Riku? I've thought about your 2nd point too when replaying CoM recently. Namine erased Kairi from Sora's memory and replaced herself in the childhood memories. I think Riku was always meant to stay in Sora's memories - though if he had found Sora in CoM, then they might have had to wipe Riku from Sora's memory or make his memories of Riku bad ones instead so their plan couldn't be foiled. Yeah, I agree. They used Repliku as a lure to keep drawing Sora up Castle Oblivion, and that could not be done if he could not remember Riku. When writing this, I forgot about that temporarily. I wonder if it would have been smarter for them to wipe Riku from Sora's memories. If they did this, then Riku would not be a potential ally. After all, Vexen knew Riku was in CO, and they could have kept antagonizing Sora with threats against Namine like Larxene did. Repliku was there, so we could fight Riku in CoM. Because those fights were fun, I approve haha. The literal chain of memories Naminé is breaking in the game is still one of the strangest concepts of Kingdom Hearts. Disconnect it and the past becomes blurry for all people who were connected once and witnessed the event (Final Fantasy IX explores a somewhat similar concept), going even so far as erasing written evidence, although Jiminy's Journal might be a very special case. Since we only see Naminé doing it in action once (erasing Repliku's memories on the spot), it may have something to do with the cards you somehow have to use in Castle Oblivion or it maybe not. Still, it makes you wonder if someone with these powers can actively hide a part of the past. It also would have been a good explanation for Mickey's amnesia considering Terra, Ventus & Aqua. I do have a part of the CoM retrospective addressing Sora forgetting things by world, but had forgotten about that by the time we get to KH2! I'll try to add it back in when I get back. I agree that Namine just left Riku in deliberately, but even if CoM had played out "as it appeared," (with no twist), I think we can presume that Replku being in front of Sora would have kept him in Sora's mind. After all, the same appears to happen to Donald and Goofy, too! That's one of CoM's brilliant points. The deception is so thorough that you can't help but forget parts of it when you try to look back on the game! @Shard: Tell me about it. Explaining the Chain of Memories one revelation at a time is one of the most daunting parts of this section of the retrospective. I kept tripping over myself on previous edits and should probably make sure it isn't still confusing in the current draft! Status Update: The internet is out at my apartment. Someone's doing some work but it doesn't seem to be done yet, and I can't say for sure when it will be done. They say it might be done tonight. If that happens early enough, great, I'll still be able to get up the CoM entry for tonight. If it's not (even if it's done today but just particularly late), the Tuesday CoM entry may be delayed or skipped. I don't imagine the delay will last until the Thursday TAY post. Ideally, I may put the entry up on Wednesday, but like the skipped FFIV-I post a few weeks ago, it might prove easier to just skip a day as tomorrow is going to be a mess, internet or no. It's going to depend on circumstance. I'll try to keep you all informed! Unfortunately, repair status on my home internet is now "indeterminate." It'll be back when it's back, I'm afraid. Remember, if you want immediate reminders for when updates resume, you can sign up for the RSS or subscribe with a wordpress account, and of course I'll post here in the forum.. Hopefully it'll be in the next few days but I just can't say at this point. My internet was fixed while I was out of the house, so I set straight to work and put the post up at once! It's online now and you can read it here! Axel's in it! Glad your internet is up and running again! My only experience with CoM was the PS3 version thanks to 1.5, so I didn't really now about all the differences between the two. Seems to me like whenever these games' dialogue is written in text, it allows the localization team to elevate "creative liberties" to an art form. Some of this franchise's best English dialogue gems come from the unvoiced scenes of CoM, Days, and Re:Coded, after all. Loving the retrospective. I'm really glad you mentioned the importance of memory in the Disney worlds in this game since that tends to get glossed over a lot. Wonderland also raises some interesting points about memory as well. Yes, Wonderland is also a favourite. Then there are the worlds that make... less sense. Agrabah is one I'm particularly excited for. Random Jokers appear in every world except Traverse Town with a % chance depending on mode: 4%-Beginner, 1.3%-Standard, 0.7%-Proud. Non-automatic/prize enemy cards drop at a 2-4% rate depending on enemy, and increase x2.5 in the Teeming/Looming/Almighty rooms (so 4% cards, for example, go up to 10% drop rate). Thanks Ultima Spark/hyperion, that helps a lot! I've added the info to the page.